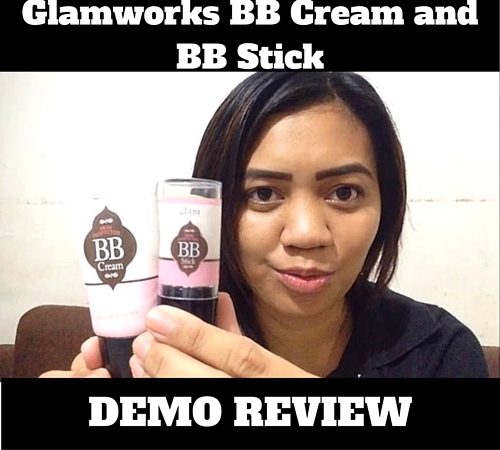 Finally I'm done making a review video of Glamworks Skin Perfector BB Cream and BB Stick. It took me about a month to film the video and upload in my YouTube channel so I deeply apologize. Anyhow today I am now ready to give you the full review of these two products or what I'd like to call as power combo. WATCH DEMO REVIEW VIDEO HERE. The Glamworks Skin Perfector BB Cream and BB Stick comes in a cute pink plastic tube packaging. It is from the maker of hair treatments and body scrubs, Glamworks. Both products are new in the Philippine market having been released at the start of 2016. 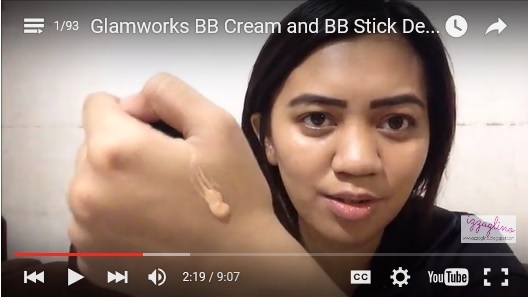 Both the Glamworks Skin Perfector BB Cream and BB Stick is priced at 149pesos. The BB Cream is 150ml in size while the BB Stick doesn't have any identification of its size. When I first bought the product my goal is to just to feature a new BB Cream that's out in the market. I don't have that much expectation since it's only 149pesos plus the brand behind the Glamworks Skin Perfector BB Cream and BB Stick is known for hair treatments and body scrubs. This is actually their first attempt in the makeup line (that I know of). Now I am a big BB Cream and CC Cream fan. I prefer BB Creams over foundations for they never make me look cakey plus they are more budget-friendly (the local brands). READ: My Local BB Cream Collection. So buying Glamworks Skin Perfector BB Cream and BB Stick is a no-brainer for me. Upon Application. The texture of the product is creamy and thick but so better apply first a thin layer. It spreads smoothly in the skin and can be blended easily. There is shimmer or sparkle in the product. This works well for oily skin and those that have normal or combination skin. It also has a very amazing scent. How to Use the Product. I don't recommend applying using your finger tips because you'll keep on applying the product to build the coverage. I recommend applying using a damp Beauty Blender or sponge using a patting motion. Make sure that you spread the BB Cream evenly. Coverage. Sadly, the BB Cream doesn't give any coverage at all. I can't even say that it's a light to medium coverage because the dark scars, lines and other blemishes are still visible even with 2-3 layers. However, I love the fact that even if I have reapplied the product over and over it still doesn't look cakey and doesn't feel heavy at all. Benefits: Though it didn't give me any coverage at all I love how it brightens and even out my skin tone. The Glamworks Skin Perfector BB Cream gives a dewy finish that looks glowy and healthy. It has a non-sticky feeling on the skin so you won't have any issue wearing it on longer basis. The staying power of the Glamworks Skin Perfector BB Cream is better when powder is used. I love using my SanSan HD Duo Powder to seal the BB Cream. Because of the weather that we have in the Philippines you might need to blot or do some touch up. Doesn't have that much variety on the shades. Upon Application. This is actually my first time trying out a BB Stick and I primarily love the experience. The Glamworks Skin Perfector BB Stick glides smoothly on the skin. The only problem that I have with this one is that it's so chunky so putting it on the under-eye area can be a struggle. I picked a lighter shade than the Glamworks Skin Perfector BB Cream so it would help me do some highlighting. How to Use the Product. What I love about the Glamworks Skin Perfector BB Stick is that it's not messy to use. I just apply the product like how I normally apply a concealer stick. I slide on the under-eye area, bridge of my nose, sides of my mouth, chin, cheek bones and forehead. Then I use a damp Beauty Blender or sponge to blend. Coverage. On my review I used this BB Stick right after the Glamworks BB Cream so I already have a covered canvass to begin with. And since the BB Cream didn't do much justice in terms of coverage I rely mostly the hard work with the BB Stick. In all fairness with the Glamworks Skin Perfector BB Stick it had covered my dark spots, blemishes and redness around my mouth area. It may seem a little whiter than the usual at first but once the BB Stick settles it will look great in your skin. Benefits: The finish is still dewy and glowy. It doesn't give too much of a white face na mukha ka ng espasol. It does give you a shine-free face but not all day as the product claims. It about 4-5 hours you have to blot or repowder. For me the Glamworks Skin Perfector BB Cream and BB Stick works hand-in-hand together. The BB Cream is a good base if you want natural look while the BB Stick can give you that extra layer of coverage perfect for more glam look. This is another addition to my local BB Cream collection. Yehey!